The spice comes from the seed of the nutmeg tree, from an apricot-looking fruit. Nutmeg is a unique spice which is capable of retaining its pleasant flavor for many years. Nutmeg is available ground or whole, but is used in its ground form to flavor foods. This spice produces the most flavor when freshly grated, so it is useful to buy the whole nut and to have a nutmeg grater on hand. Nutmeg can be used to flavor milk, mulled cider and wine, eggnog, cookies, cakes and sweet breads. Nutmeg is the characteristic flavoring of white sauce, stews and ragouts. It is also used in sausages and pastries, ice cream, jam, and in Indian desserts. It is most commonly found in India as a part of the Mughlai cuisine. Nutmeg is found in garam masala. Nutmeg can be found smoked in India too. The spice, mace, also comes from the nutmeg tree and is the outer case of the nutmeg seed. The spice, nutmeg, being from the seed. Choosing: The choice between ground nutmeg and whole nutmeg is an easy one: always go with the whole nut and freshly grate it as needed. Ground nutmeg may smell and taste great the first time, but once the container is opened, the quality will start to deteriorate as the spice's volatile oils are exposed to oxygen. Whole nutmeg won't last forever, but properly stored you can squeeze a good year out of it with no noticeable loss of flavor. Buying: You can buy Nutmeg at your local grocery store. Whole nuts are preferable to ground nutmeg, as flavour deteriorates quickly. Whole nuts will keep indefinitely and can be grated as required with a nutmeg grater. Nutmeg is poisonous and should be used in moderation, a pinch or two is safe. Store both ground and whole nutmeg away from sunlight in airtight containers. Store whole nutmeg in a dark, tightly sealing container and store in a cool place. The freezer is ideal. 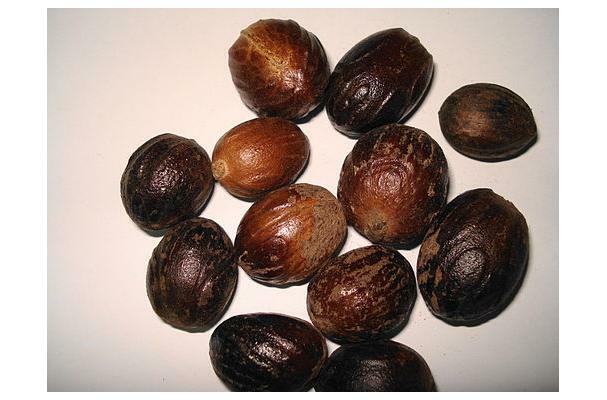 World production of nutmeg is estimated to average between 10,000 and 12,000 tonnes (9,800 and 12,000 long tons) per year with annual world demand estimated at 9,000 tonnes (8,900 long tons); production of mace is estimated at 1,500 to 2,000 tonnes (1,500 to 2,000 long tons). Indonesia and Grenada dominate production and exports of both products with world market shares of 75% and 20% respectively. Other producers include India, Malaysia (especially Penang where the trees are native within untamed areas), Papua New Guinea, Sri Lanka, and Caribbean islands such as St. Vincent. The principal import markets are the European Community, the United States, Japan, and India. Singapore and the Netherlands are major re-exporters. At one time nutmeg was one of the most valuable spices. It has been said that in England, several hundred years ago, a few nutmegs could be sold for enough money to enable financial independence for life. History: It is known to have been a prized and costly spice in European medieval cuisine as a flavouring, medicinal, and preservative agent. Saint Theodore the Studite ( ca. 758 – ca. 826) was famous for allowing his monks to sprinkle nutmeg on their pease pudding when required to eat it. In Elizabethan times it was believed that nutmeg could ward off the plague, so nutmeg was very popular. The small Banda Islands were the world's only source of nutmeg and mace. Nutmeg was traded by Arabs during the Middle Ages and sold to the Venetians for very high prices, but the traders did not divulge the exact location of their source in the profitable Indian Ocean trade, and no European was able to deduce their location.